and Dr. Michelle Sabater Weddle. We understand that everyone’s dental needs are different. We take the time to listen to your concerns and have an open discussion about your options. We partner with you to come up with a plan that will best suit your needs immediately, and in the future. Ask us your questions, and hopefully we'll have the answer. If not, we'll find the answer together. The more you know about your oral health, the better you'll be able to take care of yourself. As a practice, we will use our knowledge to center our services on you - your needs and desires. We are true believers that preventive care and knowlege are the keys to optimal dental health. We strive to provide “dental health care” vs. “disease care”. That’s why we focus on thorough exams – checking the overall health of your teeth and gums, performing oral cancer screenings, reviewing muscle and temporomandibular joint health, and taking x-rays when necessary. Not only are we focused on the beauty of your smile, we’re also concerned about your health and function. A review of your medical history can help us stay informed of your overall health. Medications and medical conditions may impact your dental health as well as vice versa. So please keep us updated with this information. As general dentists, we are the primary oral health care provider for your family - and we take this task seriously! Our strength lies in the diversity and frequency of education and training that our doctors and staff undergo. Our doctors' continuing education hours averages 3 or 4 times more than state and licensing board requirements. This means that we are able to stay on top of current developments, new techniques, and the latest and most effective products and equipment in order to deliver state-of-the-art dental care for our patients. Our doctors provide dental care for the whole family, with children able to receive dental care starting at age 1. We offer family-friendly hours and we encourage our patients to bring their children to their appointments. Our office has a children's table with crayons and coloring pages to occupy their time. Bring their favorite DVD and we will play it on our TV, or choose from our selections in the office. Great Smiles Elizabeth: Elvira Dela Torre, DDS is a local family dentist practice in the 07208 area. We work with patients of all ages and can treat children as young as one year of age. Our staff makes it easy to receive dental care by streamlining our appointment process, patients are in and out quickly. We understand that life is busy and as a family dentist we are proactive in making a trip to the dentist fun for the entire family. With a friendly staff, comfortable waiting room, toys and stickers, Great Smiles Elizabeth: Elvira Dela Torre, DDS is a local destination that even the kids will enjoy coming to. We provide a variety of dental services to treat your family’s needs. This includes teeth cleaning, examinations, teeth whitening, root canals, veneers, cosmetic dentistry, Invisalign and more. If you live in the 07208 area stop by and meet our dentist. We are local, approachable, and make a trip to the family dentist enjoyable. Our dentist office is located in Elizabeth. We are your local dentist office, serving people that live in the 07208 area. We pride ourselves in providing the best in patient care and put our patients needs above all else. Believing that it should be easy for people to obtain quality dental care, we offer a variety of services in our office that include teeth cleaning, teeth whitening, root canals, crowns, dental implants, cosmetic dentistry, bridges, veneers, and more. Patients can receive the care they need from our experienced and compassionate dentists. We understand that some people have had negative experiences with dental treatments and our team goes above and beyond to make sure that patients can relax and feel comfortable from the moment they walk in the door, when they are sitting in the exam chair, and after their procedure has been completed. 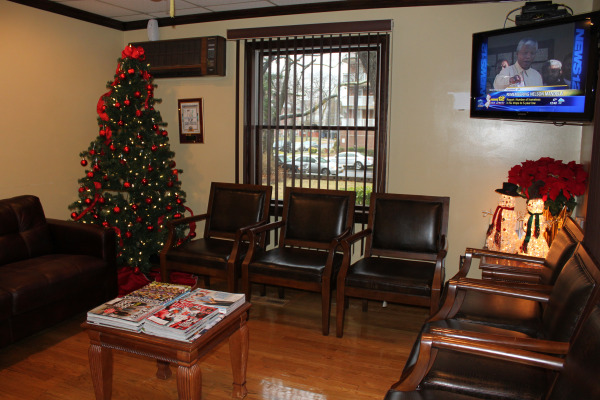 Our Elizabeth dentist office is the destination for quality patient care. Teeth whitening is one of the fastest ways to improve your appearance. A bright, white smile is youthful and energetic. It is a welcome sign that shows people that you take care of your health and appearance. We provide teeth whitening services in the 07208 zip code from our Elizabeth teeth whitening office. We are in the business of transforming smiles and restoring confidence. While a simple procedure, teeth whitening is most effective when completed in a dentist office. We use modern technology and laser dentistry to whiten teeth by several shades in one sitting. These results are much faster than anything done at home. The procedure is also extremely comfortable and won’t cause patients pain. Our teeth whitening services can be performed quickly, and even squeezed into your lunch break. If you live in Elizabeth or the surrounding 07208 area stop by, schedule an appointment and watch as your smile looks new again. We invite you to contact Great Smiles Elizabeth: Elvira Dela Torre, DDS at 908-352-7730 for all of your Dentist, Family Dentistry and Teeth Whitening questions.